Remington has reinvented the coffee maker and I'm so excited to introduce you to it! The sleek new iCoffee uses a whole new technology called SteamBrew, that does so much more than just dump hot water over coffee grounds. iCoffee's patented SteamBrew technology uses steam jets inside the coffee brew basket. The jets pre-steam the coffee, then stir the coffee grounds during the brewing process so the coffee grounds are completely suspended and surrounded by hot water at the perfect brewing temperature. Next, a rich coffee crema forms, indicating the elimination of bitter and acidic aftertastes. Fortunately for me, my new iCoffee arrived just as my old coffee maker died. Can you imagine navigating a Monday morning without coffee? So my husband and I stumbled around the kitchen, unpacking the iCoffee and reading directions. Thankfully, it was a simple process, and what fun to push the start button and hear music announcing the start and end of the SteamBrew technology! There is even a brew window so I can watch the amazing SteamBrew technology in action. The iCoffee has a coffee brew basket so it requires no paper filters, which means I'll save money and decrease the trash we throw out. I simply rinse out the brew basket with its premium goldtone filter and scoop in more coffee grounds for my next pot! iCoffee also offers programmable auto start, so I can set the time I want it to start and have hot, delicious coffee already waiting for me when I wake up. Did I mention HOW much more delicious my coffee tastes with this new SteamBrew technology? It's absolutely heavenly and tastes so much better than the exact same amount of coffee grounds in my old coffee maker! One of the things I really like about iCoffee is the open area where the coffeepot sits on the heated plate; it allows me more flexibility to pick up the coffeepot from any direction (as opposed to a boxed-in design). The coffeepot is also lighter than my old one and the handle is more comfortable in my hand. The coffee brew basket itself is a step above because it has a secure-fitting lid that seals in the grounds and the steam so there's no mess from water splashing up during the SteamBrew process. Plus, not a single coffee ground got into the coffeepot or into my cup, which was unheard of with my old coffee maker. It also has a handle on it for easy removal for rinsing. iCoffee by Remington makes the most exquisite coffee I've ever tasted. It took over 7 years of testing and over 1257 prototypes for Remington to create this amazing technology and I am so glad they didn't give up! If you love coffee, you must get an iCoffee because no matter what coffee brand you like, it will taste remarkably better. Find out more about iCoffee at www.icoffee.com and shop for iCoffee at more than 800 retail locations nationwide. The website offers a store locator so you can find a location near you or shop online. 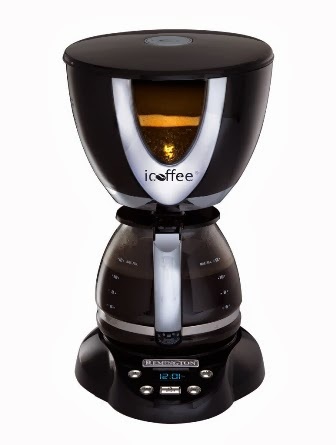 Be sure to follow them on Facebook, Twitter and Pinterest, then enter below to WIN the iCoffee! Win an iCoffee by Remington! To enter, just fill in the Rafflecopter form below. You must be at least 18 years old and reside in the USA. Only the first entry is mandatory; bonus entries increase your chance to win. Giveaway ends at midnight on 2/16/2014. Good luck! You can also enter my other giveaways HERE. Oooh I like that pre-steam action! My husband is a coffeephile. He'd love this. I like that the iCoffee uses less coffee to achieve the strength I need to drink it. Love that! Thanks for the giveaway! That would look nice in my kitchen. It took 7 years to perfect this coffee pot.This pot has a rich coffee crèma extraction that is seen forming in the exclusive Brew Window. This coffee maker makes really delicious coffee, and I just got done reading about it in Consumer Reports and they recommend this coffee pot. I would love to win! I like that the steambrew and water jets let you use less coffee and gets rid of bitter taste. I learned the coffee is pre-steamed to evenly apply proper moisture and heat. Like steaming vegetables to unlock nutrition and flavor, iCofffee uses the benefits of steam to open up and fully release only the non-bitter, non-acidic, exquisitely smooth coffee flavors. That this system works to keep the bitterness, acidity from the coffee. I learned iCoffee releases more flavor from the same amount of coffee and allows you to use less coffee to achieve the same boldness. iCoffee drinkers report using less coffee to achieve desired strength and exquisite flavor. I really like this because I love French Press Coffee, but it takes too long and uses too much coffee to make it on a regular basis. This coffee machine says it's better than drip coffee and comparable to french press without all the work!! I love how this steams to heat the coffee. I have a drip coffee maker but I know coffee can taste better! You use less coffee and it tastes better. I love that you don't have to use paper coffee filters. The name Remington has been associated with coffee brewing since 1846. Thank you for another super giveaway opportunity. Keep up the terrific blogging. I learned that iCoffee first steams the coffee grounds to get them evenly moist. I like the idea of using less cover and still having all the flavor. It is a 12-cup fully automatic, 24-hour programmable coffeemaker. It uses less coffee! How great is that! I am amazed that it actually uses less coffee than usual brewers. That is awesome! I learned that the iCoffee is BPA and lead free. I found out I can buy one at Bed Bath and Beyond. Presteam and I can purchase at my local home store. I love that it makes coffee so smoothly! Can't wait to try one! I learned that they went through 1,257 prototypes! I learned that it took 7 years and 1,257 prototypes to develop the iCoffee's SteamBrew. Its good to know that the iCoffee releases more flavor . I love that you can watch the Steam Brew action! I love that it uses water jets, thats soooo cool! I learned that I can buy this at Dillards. iCoffee appeared on the nationally syndicated, emmy award winning TV show "The Doctors" on Monday, January 20th, 2014.
iCofffee uses the benefits of steam to open up and fully release only the non-bitter, non-acidic, exquisitely smooth coffee flavors. I like that it extracts only the most rich coffee flavors! I learned that single serve makers forfeits perfect coffee extraction for speed. I love the fact that it allows you to use less coffee. This is a great little machines. I am copying and pasting since their website said it better than I ever could as follows: iCoffee releases more flavor from the same amount of coffee and allows you to use less coffee to achieve the same boldness. iCoffee drinkers report using less coffee to achieve desired strength and exquisite flavor. I learned that The iCoffee by Remington brewer does not contain lead or BPAs Only a few enlightened companies, like iCoffee by Remington, have chosen to remove them from all their products. "The health and safety of our customers is paramount" continued Burrows. "You can be 100% sure that none of our products will ever contain lead or BPAs, I guarantee it." I like that you can actually see the coffee brewing through the machine. I learned that iCoffee releases more flavor from the same amount of coffee and allows you to use less coffee to achieve the same boldness. I like the brew-viewing window. I like that it uses less coffee. We go through so much here. I love that it uses 6 jets to steam and stir the coffee while brewing! I like that I can use less coffee! I spend a small fortune on it! I love the idea that you do not have to use as much coffee for a richer flavor like many other coffee makers. I learned that iCoffee releases more flavor from the same amount of coffee and allows you to use less coffee to achieve the same boldness. iCoffee drinkers report using less coffee to achieve desired strength and exquisite flavor. I learned that they are on the consumer reports hot list! Thanks for the giveaway! I like that the bitterness is eliminated and it gives you a smooth cup of coffee. I love that they have figured out a way to take the bitterness out and that you use less coffee. I like that the iCoffee uses less coffee to achieve the strength I need to drink it. I love that it allows you to use less coffee to achieve the same boldness. I learned that Bruce Burrows invented iCoffee brewer. I like that the icoffee brewer does not contain lead or BPA. The iCoffee brewer is engineered to extract only the most exquisite coffee flavors. I was excited to watch the process video highlighting the step in the cycle in which the CREMA is created ~ and my Honey/Hubby (who's been in the restaurant business for MANY years) say that stirring or spinning up the CREMA is THE most important step in brewing the perfect pot of coffee!!! (I was also impressed that the iCoffee Brewer was given high ratings in Homeworld Magazine AND even made the COVER on Consumer Reports! I learned that this product lets me use less coffee and also reduces bitterness. I like the pre-steaming...looks like the way to go. it uses less coffe and tastes better. no more bitter! I learned that it has a brew window and you can watch. I learned that it creates a stronger smoother coffee! I learned iCoffee releases more flavor from the same amount of coffee and allows you to use less coffee to achieve the same boldness. I really like that it is 24-hours programmable! I learned Six patented SteamBrewTM hot water rotational jets further steam, and stir your favorite coffee releasing a symphony of exquisite flavors. I love that it has steam brew technology! I learned that the Remington name has been associated with coffee brewing since 1846. I like the fact that it stirs the Coffee while it is brewing, and you get to watch! It can be purchased at Bed, Bath, and Beyond. I learned that it has a brew-viewing window. It is BPA and lead free. I love how the iCoffee’s modern design allows the coffee lover to observe the SteamBrew process through the Brew-viewing window. I learned that Consumer Reports preferred the taste of coffee brewed in Remington machine versus traditional drip coffee makers. I like the videos on their site that show you what they are talking about. I really like the way that it brews. I like that the iCoffee by Remington brewer does not contain lead or BPAs. I like that iCoffee releases more flavor from the same amount of coffee and allows you to use less coffee to achieve the same boldness. iCoffee drinkers report using less coffee to achieve desired strength and flavor. The iCoffee produces a richer, smoother coffee, with less coffee - always a good thing. i like that you can actually watch the steam brew system. I like that the steambrew and water jets let you use less coffee and gets rid of the bitter taste. I love that you can watch the steam brew in action. You use less coffee and it tastes much better! I like the fact that it's BPA and Lead free. I like the idea of watching the action take place while smelling fresh ground coffee percolating. I love that you can use less coffee to get your perfect brew- great way to save $. Nice coffeemaker. I like the SteamBrew Pre-Steam - It Unlocks Nutrition and Flavor. First, the coffee is pre-steamed to evenly apply proper moisture and heat. Like steaming vegetables to unlock nutrition and flavor, iCofffee uses the benefits of steam to open up and fully release only the non-bitter, non-acidic, exquisitely smooth coffee flavors. I learned that six patented SteamBrewTM hot water rotational jets further steam, and stir your favorite coffee releasing a symphony of exquisite flavors. Thanks for the giveaway… iCoffee drinkers report using less coffee to achieve desired strength and exquisite flavor.